Go here to pick out your boxes! 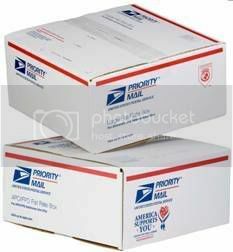 You can also get a Flat Rate Holiday Shipping Kit that includes four sizes of Flat Rate Boxes and a Gift Card Envelope. I agree with the above poster. If you need them right away you’re better off picking a few up from the local Post Office. I would be careful of the 7 – 10 days delivery time. I ordered these when they offered them last October. They didn’t show up on my doorstep until February. Which really didn’t help with the Christmas season at all!